Is anyone able to help identify when and where this piece originates from? Any help would be very appreciated. 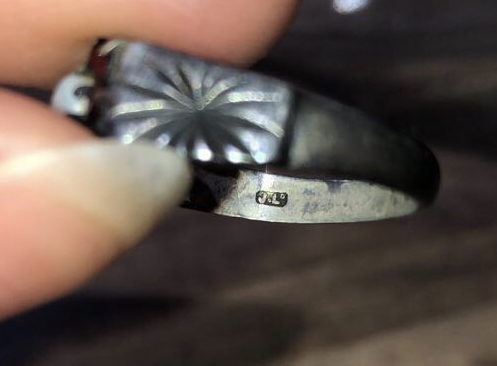 There is a stamp on one side of the silver band that reads ‘J.L’ with what looks like a small ‘D’ in the top right corner. 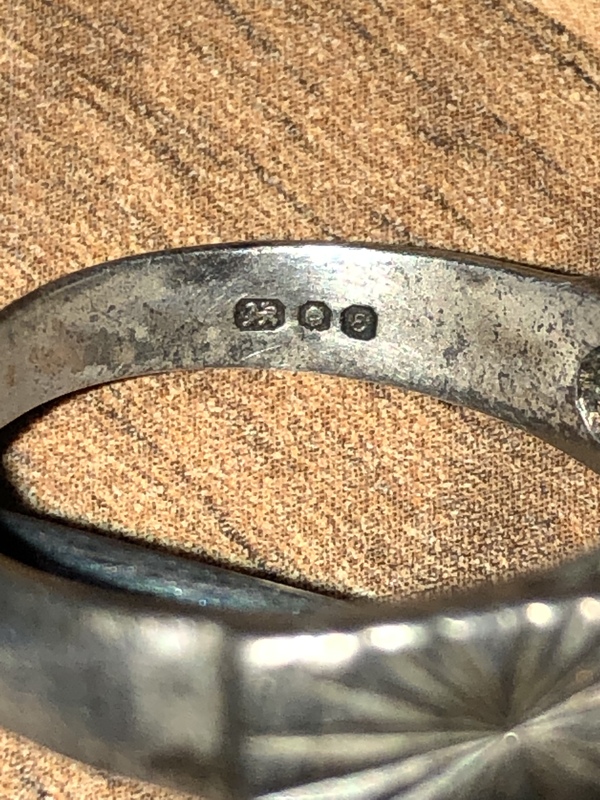 On the opposite side of the band are three stamps, one of which is what looks like a lion, the 2nd stamp I can’t make out what it is but the third looks like the number 8. It’s is a silver band with what I thing are garnets with an opal in the centre. That is an English hallmark with the lion passant showing that the ring is sterling silver. Unfortunately your picture is not clear enough to make out either the town mark or the associated date letter. You will need to post a clearer picture before any identification can be made. 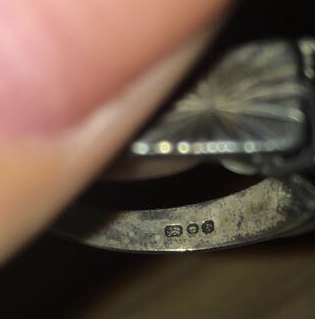 It is often possible to get a better picture by photographing the mark through a jeweller’s loupe or even a simple magnifying glass. Thank you for your response. Is this better? From what I can see through research am I correct in thinking it’s a piece manufactured in London in 1979? It’s definitely a London 1979 hallmark. Strictly speaking that is not enough to say that it was manufactured in London - only assayed there. The maker, J Ld, is not known to me. Thank you again for your response. I have had trouble finding out the maker, although some sources have suggested the stamp may stand for J Ltd ( JL D) - not sure how I would go about finding out more? If you ask them and get an answer we would appreciate an update to this post. I have sent them an email this morning, and will let you know if or when I get a response! 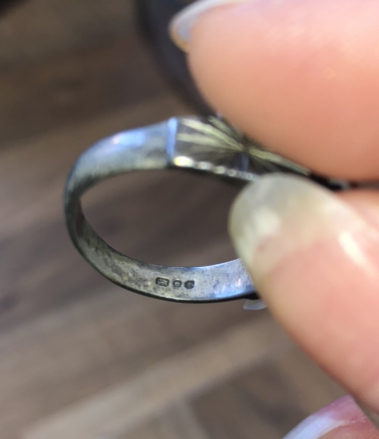 I have received an email from the assay office London to confirm the maker is Jadales Ltd. who are part of the Signet Group PLC. Many thanks for posting the answer - another little bit of knowledge made public!